Outfield is a fun position because just from the sheer quantity of outfielders that there are, there are so many that can unexpectedly (or maybe it is expected if you’re a fantasy shark) ascend to the top 30 outfielders in any given year. For instance, last season we saw the likes of A.J. Pollock, Lorenzo Cain, Mookie Betts, and David Peralta emerge to be some of the best return on investments in the fantasy outfield landscape. Who will be this year’s risers? Keep on reading to find out who The Backwards K thinks it will be! Below are THE BACKWARDS K 2016 FANTASY BASEBALL OUTFIELDER RANKINGS (#1-30). Included for each player is “The Backwards K Quick Take” and a self-produced player projection for 2016. In the pre-season, I suggested that Brandon Belt, first baseman of the San Francisco Giants, would be “This Year’s Todd Frazier.” I didn’t truly believe that he would be able to step into the ring be the Ali to this Frazier and go toe to toe with him to match all of Frazier’s 2014 stats, especially in the stolen base category, but Belt did appear to be in a great position to post the best season of his career with something along the lines of a .270 AVG with 25 HR and 10 SB (my actual pre-season projection for Belt was: 266 AVG, 27 HR, 88 RBI, 82 R, 11 SB, 149 K, 58 BB in 580 AB). Belt started the season off really poorly as he struggled to hit for a .200 AVG for most of April, and he didn’t hit his first HR of the season until May 15 (his 31st game played). But Belt worked through his issues and has put together some hot streaks that have left him with a rather productive stat line. Belt’s most recent hot streak has seen him hit 7 HR in 10 games in August, which includes a 2 HR performance on Tuesday night where he did a couple things that he has failed to do well all season: hit for power at home and produce against left-handed pitching. Both of Belt’s Tuesday night long balls were off Scott Kazmir fastballs that he crushed — one deep to center field and one to the opposite field at AT&T Park. The big day brought Belt’s season stat line up to a .272 AVG with 17 HR, 52 RBI, 54 R, and 5 SB. Previously, just 2 of 15 of Belt’s home runs this season came against left-handed pitching (with a .205 AVG), and also just 2 of 15 of Belt’s home runs this season had come at his home park. With that incredibly deep corner in the right-center field gap at AT&T Park, left-handed power production is suppressed a lot — that is of course unless you take a little somethin’ somethin’ like one former Giants player with the same initials as Belt used to do, and I’m not talking about taking Wheaties and I’m not taking about Bud Black. So with the big day of countering some of his weaknesses, it’s worth taking a closer look at Belt to see how he has progressed this season. The first thing that jumps out when digging deeper into Belt’s season is that he has a relatively high .344 BABIP. With the league average BABIP this season sitting at .297, the initial thought may be that Belt has been getting pretty fortunate with the balls that he has been putting into play. However, he’s got a laundry list of things to back up his high BABIP. Belt has always shown the ability to hit a lot of line drives with a rate as high as 25.6% in 2012 and 24.3% in 2013, but this season he’s taken it up a notch to 29.2%, which is the tops in the Majors. Hitting a lot of line drives usually means a lot of hits from those line drives, and it also can translate to a high hard hit rate. In Belt’s case, it indeed does translate that way as his 42.1% hard hit rate is 2nd best in the Majors. Belt is just one of 3 players that appears in the top 10 in both line drive rate and hard hit rate (Chris Davis and Ryan Howard), but he’s the only player who is ranking at or near the top in each, which truly shows how dangerous of a hitter that he has been and can continue to be. Also factoring into Belt’s performance at the plate is the way that he is spraying the ball to all fields. Let’s take a look at his spray charts by percentages over the last few seasons. So as you can see, this season he has become much less pull happy and taking the ball the other way as defenses began to employ defensive shifts on him in the recent years, which had an adverse effect on his BABIP and batting average. By going to the opposite field more, he is keeping opposing teams on their toes and giving them second thoughts on when and how much to shift against him. Also worth noting is that Belt has yet to hit an infield fly ball this season. Fellow National League first baseman and a player that Belt received some comparisons to when he came up, Joey Votto, has always shown the great ability to avoid hitting infield fly balls as his career infield fly ball rate is a minuscule 1.4%. Infield fly balls are a very bad thing to hit because they will not end up going for a hit in the box score 99% of the time and they also do not generate any type of run production or simply just moving a base runner over. It’s something that Votto has mastered over his career and now Belt seemingly has matured in that same fashion this season, which is just another positive effect on his BABIP and batting average. As for Belt’s power, he is definitely taking steps forward in that department as well. His total of 17 HR already this season matches a career high that he set in 2013 in 46 more games played and his average distance on home runs and fly balls has shot up from 279 feet last season to 296 feet this season (38th in the Majors). So Belt has all these great things working in his favor, things that he has likely put a lot of effort into changing, but he does have a few flaws that are preventing him from taking one more further step forward. As mentioned previously, he has not hit lefties well this season nor has he hit for much power at home. The missing power at home can’t really be faulted towards Belt himself, as the park dimensions and outfield fence configuration in San Francisco are just hell for lefties. If Belt were to ever leave the Giants and hit in a hitters park, he could surely threaten to be a 30 HR type of hitter in his prime years. But hitting lefties better is definitely something that he has control over, and over the course of his career so far he actually hasn’t hit lefties much worse than righties. So the ability is there, it’s just not working out for him so far this season. But he has been showing improvements with the 2 HR off Kazmir on Tuesday, and he also had a 2 HR game in Texas this month where he took lefties Cole Hamels and Sam Freeman deep. So perhaps he’s coming around in that regard. But the one thing that is probably hindering him the most in his offensive performance is his relatively high strikeout rate. His strikeout rate this season sits at 27.1%, but he’s finished a season with a rate as low as 21.9% in 2013. And Belt’s career rate in the Minor Leagues before coming a fixture on the Major League roster was 18.5%. So the potential to cut down on his strikeouts appears to be there, but he’s going to have to do some work to tap into it — and it is against lefties where he does struggle the most as he has a 32.3% strikeout rate against them this season. It’s this high strikeout rate that is preventing him from being a .300 type of hitter. He’s got all the tools (high line drive rate, high hard hit rate, utilizing all directions of the field, low infield fly ball rate) to gets hits, but you can’t get hits when you don’t put the ball in play. So while maybe Belt doesn’t fulfill the pre-season prediction of being “This Year’s Todd Frazier” (statistically, that would probably be Manny Machado this season), he’s still enjoying a season that will likely turn out to be the best of his career so far and he’s made some very great strides while doing it. A strong finish to this season will give him some nice momentum for his age 28 season in 2016. And one thing’s certain: his stock is definitely higher now than it was at the beginning of May. Now let’s check out the rest of Tuesday’s action. For fantasy baseball purposes, the All-Star Game player voting and selection has zero bearing on anything, but the game and festivities themselves are a nice break in the action where we can have a short hiatus from constantly checking on box scores, live updates, MLB.tv, and the like. It’s a period where our significant others will be glad to have us paying more attention to them and less attention to a bunch of dudes in tight pants (*in most cases, wink wink). The AL starters didn’t pan out as I exepcted, as I felt that the fans would get it right by electing Jose Bautista over Alex Gordon and I predicted that the Royals faithful would be able to get Kendrys Morales in over Nelson Cruz. So the Royals will have four starters, which I suppose is better than the eight that they were projected to have at one point. Cain is a borderline All-Star, but Gordon definitely has no business being here. Brian McCann got left off the team, which is probably the correct call, but another Yankee Mark Teixeira made it onto the squad because of the injury to Miguel Cabrera. Despite Alex Rodriguez’ strong performance to this point, he was omitted from the roster, which may speak volumes as to how the players and coaches feel about him. Jason Kipnis made it on as a reserve second baseman, but Brian Dozier definitely should have been included somehow. Jose Iglesias and his superior defense made it over Jose Reyes, which I do not have an issue with. But one big issue that I do have is Adam Jones making it onto the roster when there are outfielders like Brett Gardner and George Springer who are having much more impressive seasons. Brock Holt doesn’t really have the stats that scream “All-Star,” but I have no issue with him making it as the Red Sox representative because he really has been that team’s MVP with his ability to play all over the field. All the starting pitchers selected were no-brainers, but it got a little tricky with the relievers. Dellin Betances, Glen Perkins, and Zach Britton have undoubtedly been the the American League’s best closers, but Huston Street could have easily been selected over Brad Boxberger. Then there’s no issue with manager Ned Yost selecting his own setup man Wade Davis and the Orioles setup man Darren O’Day, but it is a bit of a homer pick by Yost to choose Kelvin Herrera. Herrera is having a nice season, but nothing too dominant, and this spot could easily have gone to Street or he could have chosen one of the outfield snubs. 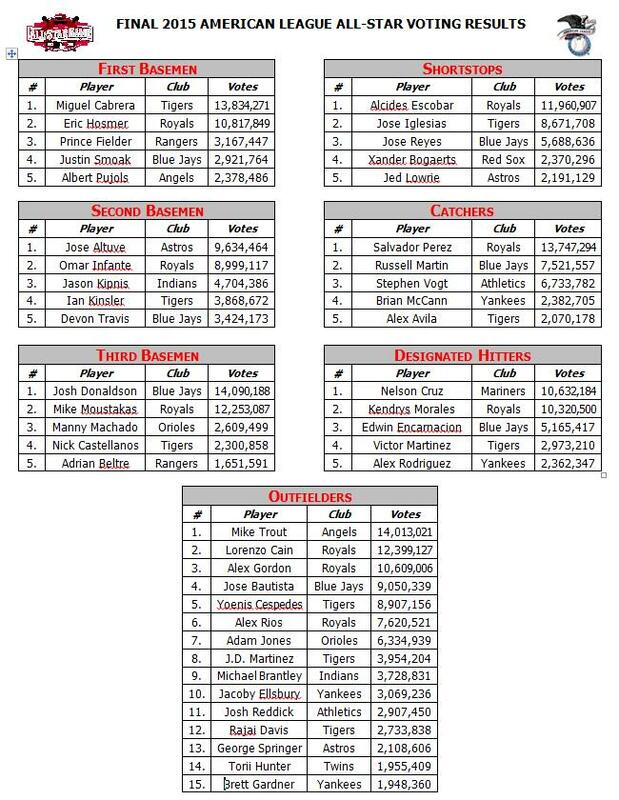 Out of the final vote candidates, Brett Gardner and Brian Dozier are clearly the most deserving of being All-Stars, but given the strong backing for the Royals players this season, I expect Mike Moustakas to win the vote. Moustakas is having a breakthrough season at the plate being able to hit left-handed pitching now, but there are better players that deserve it more. All the NL starters went as I predicted and everyone is deserving of the starting nod besides Matt Holliday. 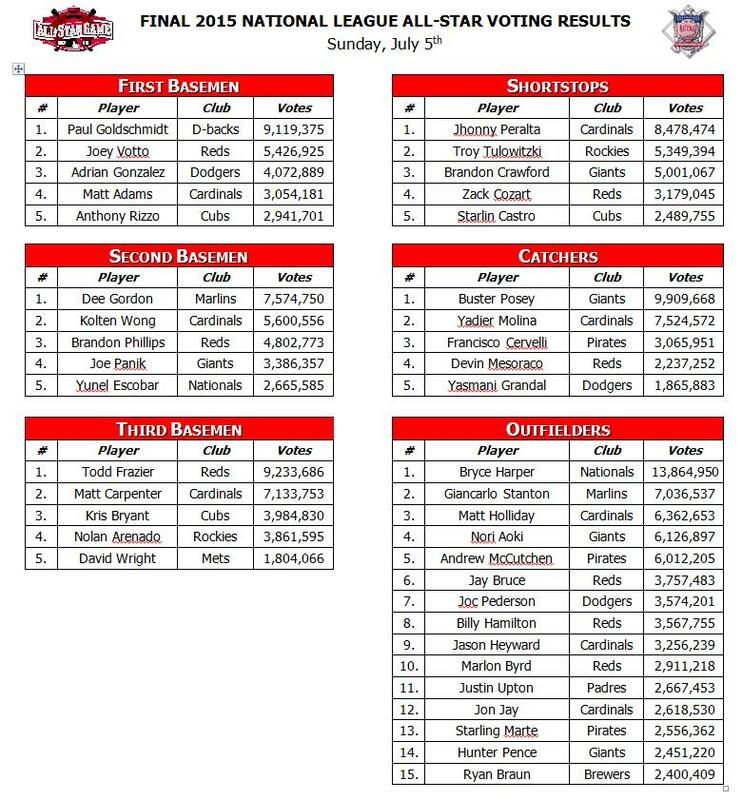 Right away there’s a snub that with Yadier Molina making it over Derek Norris. Having Molina as an All-Star is purely just a reputation pick because Norris has been the better offensive catcher all season long and though his defense hasn’t been as good as Molina’s, he still ranks pretty high up there for NL catchers. With Joey Votto’s recent slump, it’s no surprise to see Adrian Gonzalez selected by Bruce Bochy. Also no surprise to see is that Bochy went with the homer picks and selected his middle infielders, Joe Panik and Brandon Crawford to the team. One of them should have been left off the roster in favor of Troy Tulowitzki who has been ripping the ball as of late. Kris Bryant is a questionable pick to take Giancarlo Stanton’s place on the team, but the fans will surely like to see Bryant partake in the Home Run Derby if they can’t see Stanton. And it is a bit odd that Andrew McCutchen was selected over his teammate Starling Marte despite the fact that Marte has been having the superior season. Perhaps Marte’s recent oblique injury had something to do with it, but he is still on the active roster and not on the DL. I am a bit surprised that Clayton Kershaw is not on the All-Star roster, but I do not have a problem with A.J. Burnett appearing to be the one to have beaten Kershaw for it. Kershaw just hasn’t been as dominant this season, despite leading the league in strikeouts, and it’s a nice honor for Burnett to go to the game in what is going to be his final season in the Majors. It is a bit of an upset for Mark Melancon to make the squad over both Jeurys Familia and Drew Storen. Yes, Melancon has leads the league in saves, but Storen and Familia have been much more dominant. If Ryan Braun had been selected as the Brewers representative, then that would have left Francisco Rodriguez off, which also would have opened up a spot for either Storen or Familia. Despite the Reds playing host to the All-Star festivities, I expect Clayton Kershaw to beat out Johnny Cueto for the final vote. MLB fans around the nation just love Kershaw too much for him to not win this 5-man popularity contest. Switch hitting has been a prevalent part of the game for decades because generally speaking, hitters do better against opposite-handed pitching than they do against same-handed pitching as I have outlined in “Fantasy Baseball Strategy: Using Platoons to Your Advantage.” The idea behind it all is that hitters just tend to see the ball better out of opposite-handed pitching and have an easier time dealing with breaking balls that break toward them instead of away from them. Many ball players will practice and develop the ability to hit from both sides of the plate when they are young as a way to gain this slight advantage, but it certainly is tough to master. When I was in Little League, I would head to the batting cages before all my games to warm up and I would practice switch hitting just for fun. As a natural righty, I would flip over and hit lefty in the cages sometimes and while I could consistently make contact with the ball, the same type of power was just not there. So I think it is an impressive feat for any player that is a switch hitter and can hit equally for average and power from both sides of the plate. But what about pitching with both hands? If having the ability to hit both right-handed and left-handed gives an advantage for hitters, then wouldn’t the same be true for a pitcher who can throw with both hands? A pitcher with this ability could pitch right-handed to all right-handed batters and pitch left-handed to all left-handed batters to obtain an advantage much in the same way that switch hitting does. For me, trying to switch hit is hard enough, so I can’t imagine trying to switch pitch. Heck, I can’t even brush my teeth left-handed let alone throw a baseball with the same type of accuracy and force that I do with my right hand. But there is a pitcher in the Oakland A’s organization named Pat Venditte who was just called up to the Majors for the first time in his career, and you guessed it, he is a switch pitcher — the first of his kind to appear in the Majors since 1995. The soon to be 30-year old Venditte was originally drafted by the Yankees and spent 7 years in their Minor League system before catching on with the Oakland organization for the 2015 season. Venditte has been a relief pitcher for basically the entirety of his Minor League career (250 relief appearances in 259 total games pitched) and he has done pretty well with a career 2.37 ERA, 1.06 WHIP, and 9.99 K/9. With numbers like that and the ability to switch pitch, it is a bit of a wonder why it has taken so long for him to receive a promotion to the bigs. Not only does he switch pitch, but he also does it with a sidearm motion from both sides, giving him even more novelty. Venditte made his Major League debut right upon his call up on Friday against the Red Sox and he pitched two scoreless innings allowing just one hit while also striking out one batter. He’s going to work in middle relief for the A’s, but one has to wonder if he could ever work his way into the closer’s role. He gained experience as a closer in his first two seasons in the Minors, but he has only recorded one save in the last 4+ seasons. And because of his soft tossing ways (sitting around 85 MPH on his fastball), he does not profile as a typical closer. However, Billy Beane and the A’s are known to be revolutionary in utilizing uncommon approaches to maximize the most out of the players on their roster. And with last year’s closer Sean Doolittle back on the DL with his shoulder injury and severely diminished velocity, and fill-in closer Tyler Clippard likely to be shopped around since he is in the last year of his contract on a last place team, it wouldn’t be too crazy to think that Venditte could be closing out games for the A’s this season at some point if he shows success in a middle relief role first. This is mostly just speculation on my part as I think it would be amazing to see a switch pitcher succeed and ascend to a more prolific role, so I wouldn’t put too much value into it. It will be entertaining to watch and interesting to see what he can do. If he ever does become a Major League closer, I will give him a hand, but it’s not like he needs one. Let’s check out what else happened on Friday!